Every garage door goes through a lot of work during its lifetime. Considering their size, it would be a miracle if no major part breaks down after a decade or two. Obviously, the different parts each have a different life expectancy, however, they all can be optimized and last longer with a regular maintenance schedule. As one might imagine, most of the parts of your garage door are replaceable. The means that when something breaks down, there's no need to get a complete garage door replacement. However, a lot of issues can be avoided by making sure your system is routinely examined and that small problem are dealt with on the spot, thus preventing a lot of potential ones. As arguably the most important parts of your garage door, the springs need to be in a perfect condition. They are in charge of supporting the weight of the door panels, so if they are compromised in any way, a lot of dangerous accidents can occur. Our experts can make sure these crucial components are not only in a good working condition but also that they are properly lubricated and that their tension is adjusted correctly. Since springs are under a lot of tension, you should never attempt to handle them by yourself. That's what we're here for. If you find them to be less than optimal, we'll perform the necessary spring replacement on the spot. In order to keep your door from closing on an obstacle, your opener has two photo-electric eyes that are in charge of alerting it when an object or a person is blocking its way. The system will then reverse its operation, thus avoiding an unfortunate accident. However, if these sensors become misaligned, they will fail to properly detect the obstacle, which is a very dangerous scenario. Our technicians will make sure your sensors are functioning correctly and that their positioning is adequate. 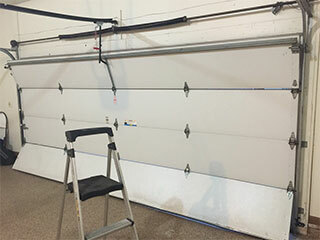 Garage door maintenance is the best way to ensure that your system is safe to use and that it continues functioning properly for a long time to come. Call our experts at Garage Door Repair Hollywood today.